One of your regular home maintenance chores should be inspecting the rain gutters that help to divert water away from the foundation of your house. You should periodically remove leaves and debris that obstruct the flow of water. This is also a good time to inspect the gutters carefully and repair any leaks or holes in the gutter material before the corrosion becomes so great that you have to replace the entire gutter. To patch a small hole in the rain gutter, use a piece of the material from which the gutter is made, according to the website RainGutterShop. Keeping rain gutters repaired will help to prevent water damage on your property. 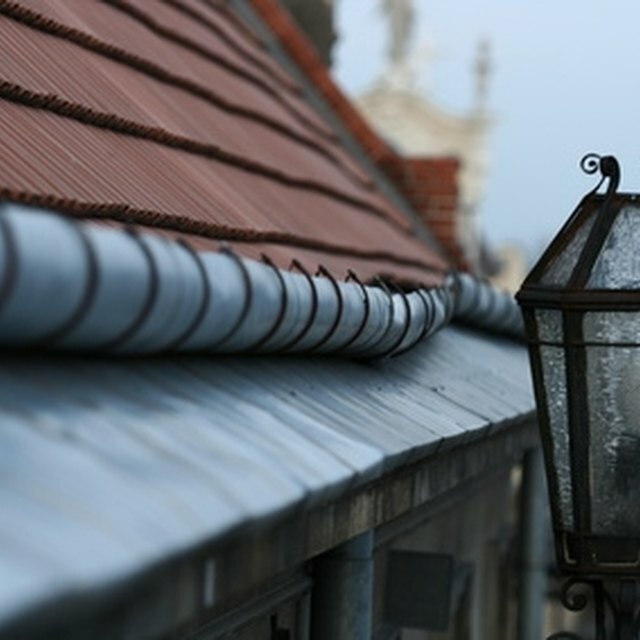 Examine the gutters carefully to locate holes and cracks in the gutter surface. Take a wire brush and remove loose rusted metal from around the hole in the gutter. Clean this debris from the gutter before proceeding. Cut the edges of the rusted metal from the affected area until you reach clean metal. Remove the pieces, and discard. Wipe the surface of the affected area clean with a cloth. Cut the patch for the hole, making it a few inches larger than the hole to overlap onto solid metal. Position the patch in place, and drill hole for screws through both the patch and the gutter material. Remove the patch. Insert screws into the drilled holes, and secure. Seal the edges of the patch with silicone caulk to prevent leaks. The website JonEakes recommends using steel wool to remove the grime that solidifies on gutter surfaces to provide a clean base for the patch. Gutter can be galvanized steel, aluminum, vinyl or copper. Use matching material when patching your gutters. You can buy small pieces of metal or plastic at hardware or home improvement stores. You might have to bend the material to fit into the area where the gutter is damaged. Use pliers and a hammer to mold the metal into the correct shape to fit into the gutter. Wear gloves and goggles when cutting metal to prevent eye and hand injuries. Have someone hold the ladder while you work on the gutter to prevent falls. Do your rain gutter patching when no rain is predicted for at least 24 hours to allow the caulk and roofing cement to properly dry and seal the patch. How Can I Stop a Downspout From Leaking?